SYLVANIA 70734, 6-in LED Recessed Kit - a high-performance, easy to install residential grade downlight solution offers good light output, energy-efficiency and a streamlined design. It fits into most 6" IC (insulated cans), non-IC and air tight incandescent cans and is suitable for damp location use. 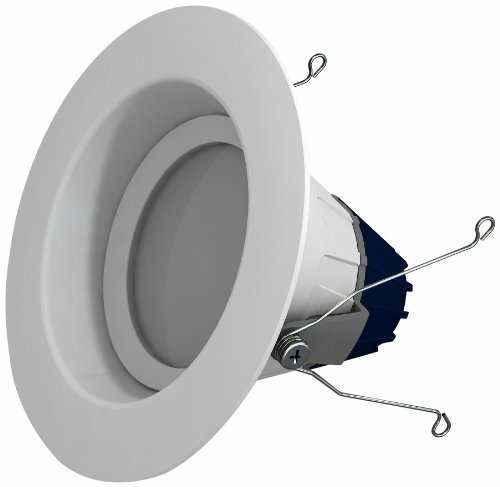 The kit includes a 6" LED recessed downlight with white trim and a medium base socket adapter. The sleek design complements most ceilings with its flush mounting style and aesthetic appeal. Available in 3000K color temperature, the 10-watt version delivers 700 lumens of light, comparable to a standard 65-watt incandescent BR30 light bulb and is dimmable down to 20%.